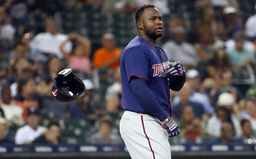 FORT MYERS, Fla. (AP) Minnesota Twins third baseman Miguel Sano will likely miss the first month of the regular season, following another procedure to repair a severe cut above the heel on his right foot. Sano was sent to a plastic surgeon at the Mayo Clinic in Minnesota, where he underwent an operation called a debridement that removes damaged tissue or foreign objects from a wound, Twins chief baseball officer Derek Falvey said Tuesday. The gash Sano suffered Jan. 26 in his native Dominican Republic when he slipped on some metal stairs on a stage during his team's winter league championship celebration was not healing as expected, so the Twins sought a more aggressive treatment for their 25-year-old slugger whose major league career has been marked more by nagging injuries than home runs. Falvey said Sano could resume baseball activity in about three weeks, with the goal of starting a minor league rehabilitation assignment in mid-April and joining the Twins in May. Fortunately for the Twins, they've got one of the most versatile players in the game to fill in after signing former Houston Astros handyman Marwin Gonzalez to a two-year, $21 million contract last month . The plan was to essentially make Gonzalez an everyday multi-positional player, but for now he'll probably take the majority of the turns at third base. For Twins, though, the news was another setback after a career-worst 2018 season for Sano during which he batted .199 with a .679 on-base-plus-slugging percentage in 71 games while spending months in the minor leagues for reconditioning. Though he came with stitches behind his Achilles tendon, Sano reported to camp noticeably slimmer after a more rigorous winter workout routine with designs on putting together the complete season the Twins have been waiting for since Sano made the All-Star game in 2017.